Most papers have pictures of large swathes of Britain covered by a blanket of snow. 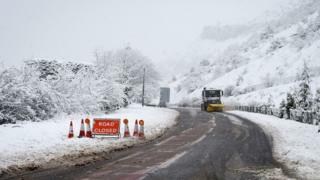 The Daily Telegraph says Highways England claimed much of Sunday's disruption on the roads was due to a lack of cars. It quotes an official saying that the gritters relied on traffic spreading the salt, but most people heeded warnings not to travel unless absolutely necessary. The Daily Express says the "big freeze" is set to get worse, with Arctic conditions possible until Christmas Day. The Times believes Theresa May's delicate Brexit compromise on Ireland is in danger of "unravelling" after the government's commitment to the deal was questioned in both Brussels and Dublin. The paper says the Brexit Secretary, David Davis - who on Sunday described Friday's agreement as a "statement of intent" which was not legally enforceable - is said to have exasperated officials on the continent and in the Irish Republic. According to the i, Mr Davis has "broken ranks" on the EU deal by saying that Britain will refuse to pay a divorce bill if the trade talks fail. HuffPost UK says the Irish government will hold the British government "to account" for the deal and described the Brexit secretary's comments as "bizarre". In an editorial, the Daily Telegraph says that throughout the tortuous Brexit process, the government's position has been remarkably consistent. It says that as long ago as last November a ministerial aide was photographed in Downing Street, carrying papers with the headline "Canada Plus." The paper says this is the government's aim - taking the UK out of the single market and the customs union, while retaining as much frictionless trade as possible. The chairman of one of the NHS's biggest trusts, Lord Kerslake, tells the Guardian that he has resigned because hospitals are so seriously underfunded that they cannot perform their key roles properly. Lord Kerslake, who has left his role at King's College Hospital, London, says that ministers are "in denial" about how much money the NHS requires. NHS England's leadership is locked in a public dispute with ministers over what they claim is the denial of sufficient funds to the health service. It is thought Lord Kerslake's resignation could prompt a renewed focus on government funding of the health service. The Independent says police are failing to attend around 11% of domestic violence calls, up from 5% between 2012 and 2016. The paper says the number of alleged domestic violence incidents going unattended by police has soared, with the worst offending forces missing a quarter of call-outs. According to the Sydney Morning Herald, former England batsman, Kevin Pietersen, believes "factional" splits could be emerging among the England cricket side attempting to defend the Ashes down under. At 2-0 down in the five match series ahead of Thursday's third test in Perth at the WACA, Pietersen tells the paper that several players questioned the decision of the England captain, Joe Root, to bat first in the second test in Adelaide, which England lost.